Too few properties for sale and dipping prices headlines this week’s news about the real estate market in the greater Cincinnati townships. As you can see the number of available properties for sale is shrinking! And the lack of homes and condos for buyers to see and hopefully buy equates to lower median list prices. It doesn’t make sense but if the local real estate market has always reacted to shrinking inventory with shrinking buyer interest. 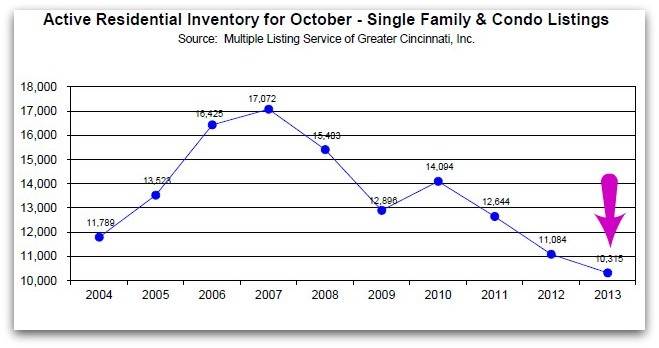 Data pulled from the Multiple Listing Service of Greater Cincinnati shows that potential buyers have 8318– single family homes and 1312 – a drop in the number of single family homes and a few more condos listed since the last township report. The median list prices for the townships have either dropped, remained the same or if your lucky and live in Springfield Township– the median list price jumped higher. The lack of “fresh housing inventory” continues to impact the market- so even though the holidays are coming…now may be a great time to list your home or condo for sale.